The traditional design of the kitchen provides the division of cooking and a dining area. Cooking area, as a functional part of the interior, has no prerequisites to decorating and creating an atmosphere of comfort. To emphasizes the purpose of the space, as well as to make the main decorative accent in the interior, use the dining area in the kitchen. Ergonomics is the science of numbers which requires constructive geometric space planning. With the right planning, you can efficiently and conveniently placing all the zones and furniture in them. For a start of calculations it is required to evaluate the total space available and allocate the room for a dining area. Single row. Used for long rectangular dishes. Working furniture and dining area is located in a row (Captain Obvious approves). Double row. Furniture is located at the opposite wall (contacting the wall plane or not) parallel to each other. Conveniently for large kitchens of square shape. L- shaped. One of the most common ways of arranging furniture, where the working area is located along the long wall, and dining zone is after the turn at the smaller wall. U-shaped. Convenient to the premises where the window is located on the side of the entrance. Dining area can reside both at the edges and in the center of the cascade of furniture. G-shaped or peninsular. Suitable for large kitchen connected with the living room. Furniture of working area repeats U-shaped arrangement method, and the “corner” is allocated for the dining area. Island. Only suitable for kitchens feature large yardage. In such case, dining area should not come into contact with any of the walls or furniture pieces of working area. Here is the finest way to unleash your designing genius. Combined. Modern designers often combine several types of dining area locations, generating new options. The dining area is connected to the protruding part of the island or the working area. It is very convenient and practical method for arranging kitchens with 8 sq. m of area ​​and more. 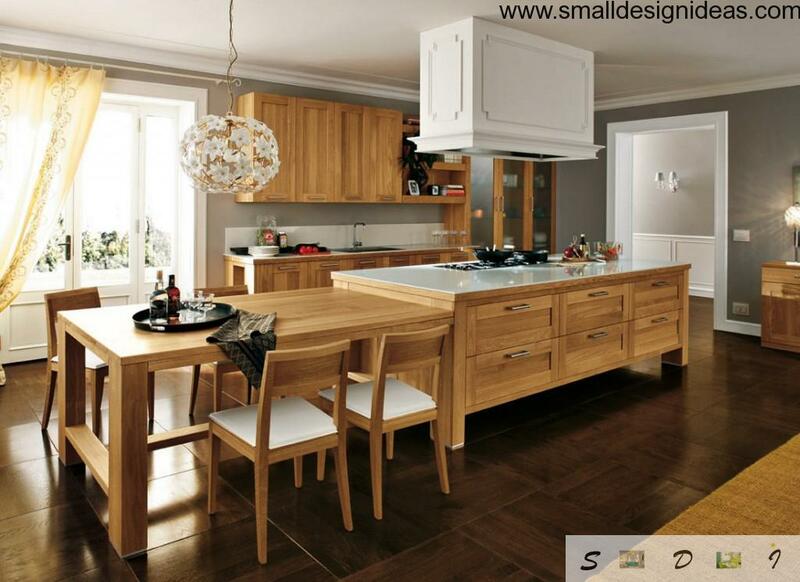 Even a small kitchen needs the dining area in it, but the deficit of square meters complicates the process of zoning. Often due to lack of space designers cut out the work area by removing less important pieces of furniture and household appliances. This approach can solve the problem, but it is at odds with the concept of aesthetics and design space. Technical quality of the space can be used with imagination. Very convenient location of the dining area is on the sill using the space at the window as the countertop. To increase the number of seats the whole dining area settling at the window. 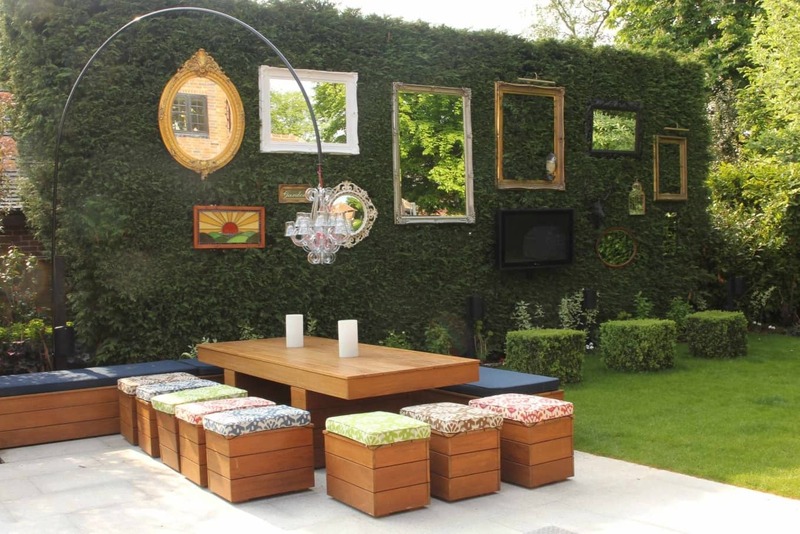 The table is set at a distance of half meter or more from the window sill, and in the gap chairs or sofa are located. This will help to increase the space between the zones. You can also use the universal folding table tops or design plan kitchen furniture in a way that would have a dining area acted as a bar. It is extremely important to note that the table top should have beveled edges to increase living space. 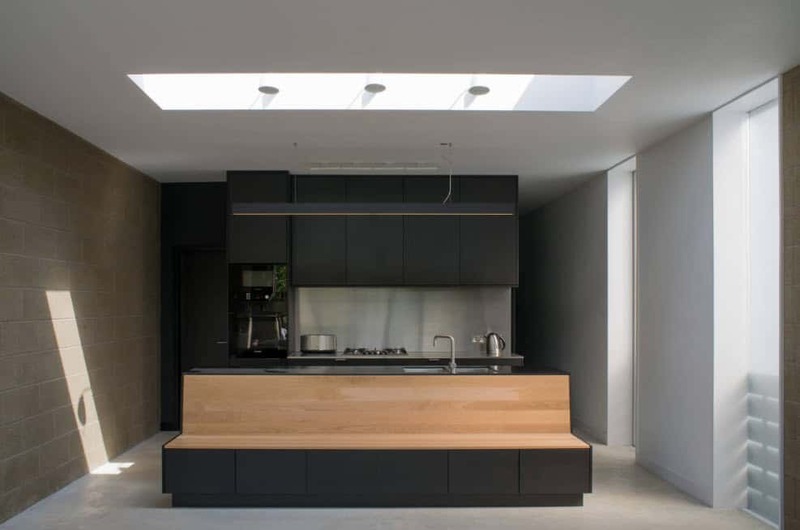 Major aesthetic focus can be given to the kitchen due to the design, as well as to emphasize the selected view layout is easier using different colors. Composition is made on the basis of both zones of the interior. Emphasizing of dining area with light is mandatory. The free space between furniture of working and dining areas should not be less than 0, 4 m.
Color is the most effective way to allocate separate part of the interior. 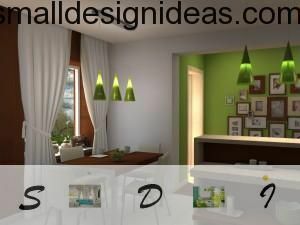 Regardless of the main room style, the color should be chosen solely in soft colors to create a psychologically harmonious environment for meal places. 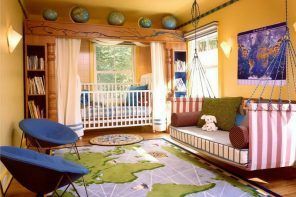 Warm range of “edible” colors: green, blue, yellow, red will create a refined emphasis on the main elements of furniture. To arrange the dining area located by island method is best to use the game of contrasts between colors and materials. The working area decorates featureless and nonspottable shades of brown, white or gray, in contrast to which stands a bright table and chairs. Dining area must serve as the main element of a kitchen, so it can be distinguished not only by color, but also by stylistic means. 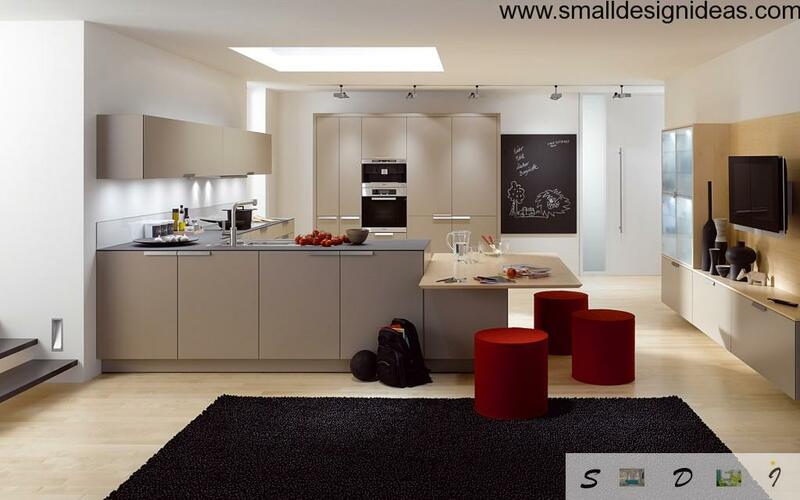 The contrast of styles is difficult to form if the kitchen has an area of ​​30 square feet and less. 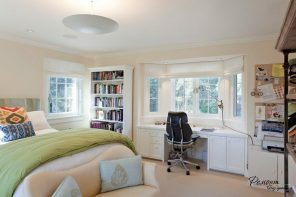 Construction of two separate styles requires a complete division of working and dining areas, relegating enough space (about 14 square feet) to each one. In the case of the island division you choose feasible and modern design option. Choosing this style for the decoration of each of the zones, you does not have to draw parallels of their mutual affinity and compatibility, but first and foremost, based on the functional and aesthetic requirements of the each zone. The more contrast and brighter is a combination of styles, the more effectively will be the composition of the interior. 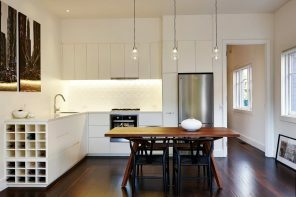 Making the kitchen in a single interior, according to the rules of formation of solid compositions, dining area should be marked by a decorations and accent of materials. With floor. Floor covering shares dining and working areas. This may be one of the coating of different colors or two different types of floor tiling. You can ever to make some unusual floor constructions such as glass floor with embedded pictures or lighting. With the walls. In the working area walls are veneered with waterproof and washable materials, whereas more “comfortable” materials, often used in the lining of the walls of living rooms, are chosen for the dining area. With the ceiling. The ceiling is also involved in the design and allocation of zones. You can use suspended multilevel structures which should not only distinguish the zone but also arrange teh lighting advantageously. With decorative elements. The decor of any form fits well. Textiles: rugs, curtains and panels, as well as tablecloths. Ceramics: vases, dishes. Additional elements: artificial fruit and flower arrangements that create a color accent. With materials and furniture. The difference of furniture materials creates a great internal contrast. For decoration of the kitchen dining area is better to use the classic styles of the interior, which are characterized by the use of natural materials, warm colors, open lighting and moderate decoration. You can combine different features of classic interiors with modern representatives. In the modern, technically equipped interior, working area looks favorably when harmoniously complemented by soft forms of classic to design a dining area.